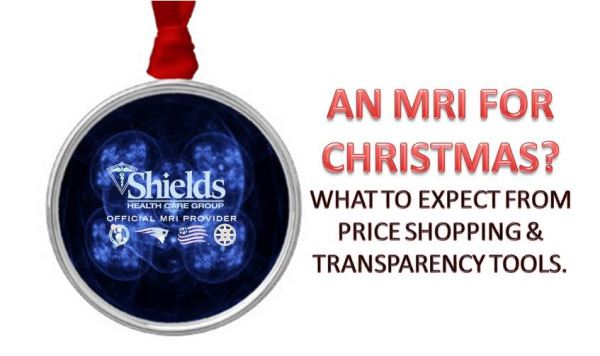 If you drove by Shields MRI in Framingham on black Friday this year, you'd have seen a line of MRI shoppers out the door beginning at just after midnight. While we are completely kidding about the scenario above, the fact is that Massachusetts is at the forefront of transparency & consumerism and as a result, we are seeing more patients actually "shopping" for health care. An MRI is a very expensive procedure and if you are on a high-deductible health care plan or have a plan that requires co-pay or coinsurance it wouldn't be too far fetched to see some money that may have been used for holiday shopping set aside for this procedure. Specifically at Shields, our Patient Financial Services department is comprised of a team of specialists who take calls from patients all day long who are looking for information on how much their MRI will cost. Lots of focus on price, not a lot on quality. Generally speaking the sites did provide pricing information for procedures, but did not have a lot of information on quality. Specifically, there was no information on radiologist experience or technology available - both extremely important to an MRI. As a patient, you don't want to save $50 but receive an MRI on a scanner that produces low-quality images. Missing pricing information. On one site in particular, there was barely any pricing information available! Many providers simply had a message that read "pricing not yet available". We hope this improves. Highlights the dramatic price difference. While some information was missing, it definitely highlighted the difference in price between MRI providers. For example, an MRI scan at South Shore Hospital in Weymouth was listed at about 40% higher than Shields MRI, located minutes from the hospital. This is great information that would help the patient choose. Different pricing for each insurance provider. The price is different for each MRI for each provider. And as noted above, some of them don't present the information at all, while others are pretty detailed. Inconsistency in displaying all charges. Each insurer lists the prices different. Some of them include all charges associated with an MRI - the cost for the scan and the reading - others only list one. This can be a little misleading. The bottom line is, while we recognize that there is a ways to go in perfecting this information so it is truly accessible and digestible to the health care "shopper", we are miles from where we were just months ago. These transparency tools can be very helpful in arming the patient with good information that serves as a starting point for managing their financial health. The most important thing that stood out to us that needed improvement was the focus on QUALITY - not just cost. With this in mind, Shields has developed a tool designed to help the patient shop around - a cost & quality comparison chart. The worksheet guides you on what information you need from your doctor to accurately compare (your scan type, whether or not you'll require contrast agent and your CPT code) and questions to ask the various providers whom you are considering. Of course, we help you along by checking off the areas that Shields MRI provides. The worksheet can be found here. Shields MRI takes it one step further with the afore mentioned Patient Financial Services team. We've invested in technology that allows us to give patients an estimate of their out-out-pocket costs so you'll have a very good idea of what you'll likely pay at the time of your appointment and when you receive your bill. To contact our Patient Financial Services team, call 1-877-712-3075.